In 1822, Alexis St. Martin, a nineteen-year-old French Canadian employed by the American Fur Company to transport furs by canoe, was accidentally shot in his abdomen at close range by a musket loaded with birdshot. He was treated by William Beaumont, a United States Army surgeon posted at Fort Mackinac, on Mackinac Island, the site of several battles to control the Great Lakes during the War of 1812. Beaumont treated his patient’s wounds but frankly expressed little hope that he would survive for more than thirty-six hours. St. Martin did survive but was left with a fistula (hole) in his stomach the size of a man’s finger, an opening which left to its own could never heal. Beaumont, who was licensed to practice medicine after completing a two-year apprenticeship (which was not unusual at the time), saw in St. Martin’s fistula a unique opportunity to observe and study human digestion in the stomach for the first time. He began his digestive studies several years after the accident. In a typical experiment, pieces of food attached to a string were placed in the hole in the stomach, and its digestion was observed. Samples of gastric (stomach) acid were removed, and this led Beaumont to conclude that chemical processes (and not mechanical factors) were responsible for breaking down food into nutrients. In 1833, Beaumont published the results of some 240 experiments he conducted on St. Martin in a 280-page book, Experiments and Observations on the Gastric Juice and the Physiology of Digestion. Doctor and patient parted company for the last time in 1833. Beaumont died in 1853 at the age of sixty-seven after he slipped on ice and sustained a severe head injury while leaving a patient’s home. Contrary to expectations, St. Martin lived fifty-eight years after his accident and outlived his physician by over a decade, notwithstanding heavy drinking in his later years. Over the years, an unanswered question was whether Beaumont chose not to perform the simple operative procedure of closing the fistula so that he could continue his experiments on digestion. 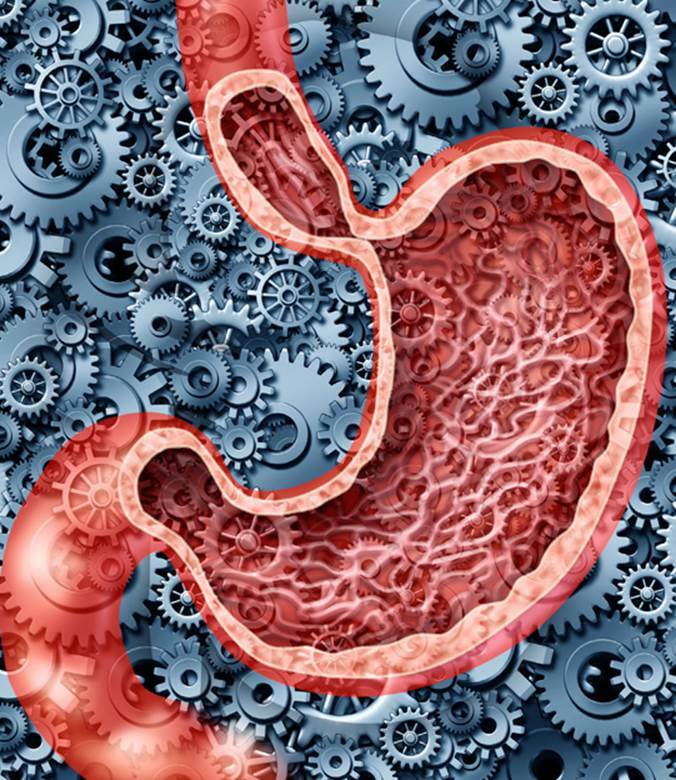 Anatomy of the human stomach, schematically represented with gears and cogs working to digest food with gastric juices.